In the very beginning, Tesla was a plane called 'Ekkremes', pitched by Circeus. Ekkremes began as a "world without mana" that "rediscovers magic" because it ebbs and flows periodically, in millennium-long cycles. However, this vision didn't last long - in each of the rounds of the Set Design Contest, the pitch was refined by different contestants. It became a set about mana, a set about colorless, a set about artifacts, etc... So, to put it simply, there were a lot of competing ideas. However, something interesting happened. Despite the fundamental differences in everyone's pitches, by just the second round, almost every pitch included a classist conflict between oppressors and the oppressed. Whether it was a technocracy versus a mage rebellion, or the factory management versus the workers, or even other more exotic ideas, they all involved this type of conflict. Why? Because this conflict is the defining feature of most 'punk' genres, including steampunk. Regardless of the mechanics or aesthetics of the set - which already alluded to steampunk, as HavelockV noted - this was apparently something that struck a chord with the audience. By the time the set was officially dubbed Tesla, it seemed most of us were in agreement about many of the things that Tesla's setting would have to account for. 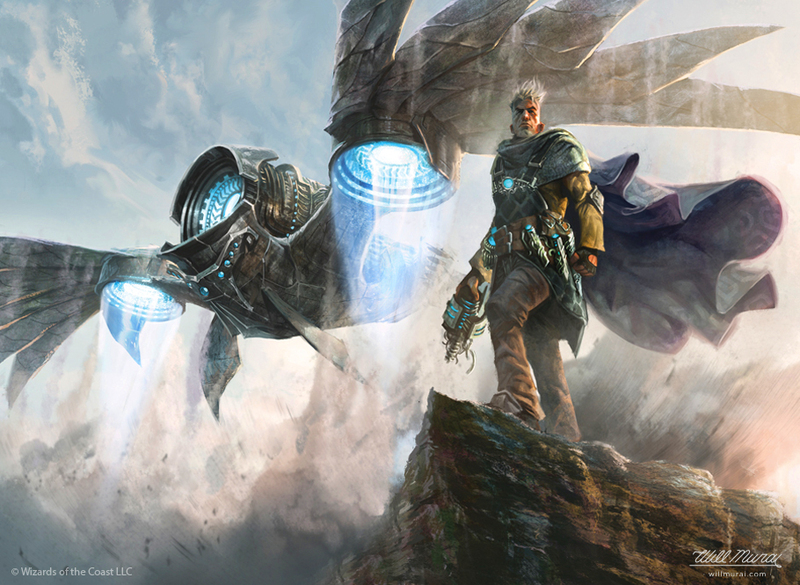 It was the 'steampunk' plane - it had to have the highest level of technology in all of Magic's multiverse, it had to feature a classist conflict of some sort, and it had to combine artifacts and magic in some interesting way. This gave us a setting that was an interesting mix of 'gaslamp fantasy' and steampunk, and a pretty clear direction in which to travel. Even without what would become Tesla's themes - progress and anticipation - we nonetheless had a strong start. For most of Tesla design, we've made the assumption that no existing plane in Magic could capture the themes that we were looking for. Though in Ravnica they have pretty advanced technology (relatively), the plane comes with the baggage of being a two-color set, and the technology is mostly specific to the Izzet. 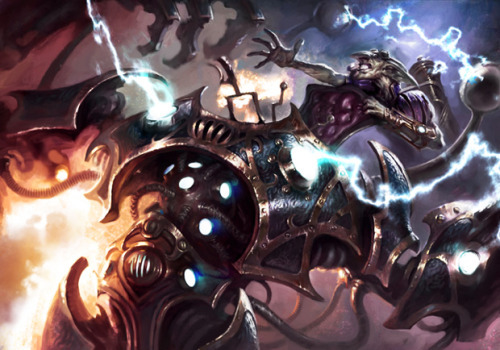 In Innistrad, the geistmages and necro-alchemists wield some advanced geist- and lightning-powered technology, along the lines of Verne's speculative science. Innistrad also has the Victorian aesthetic to boot. The problem, like Ravnica, is that the set has a much greater focus than this technological level. 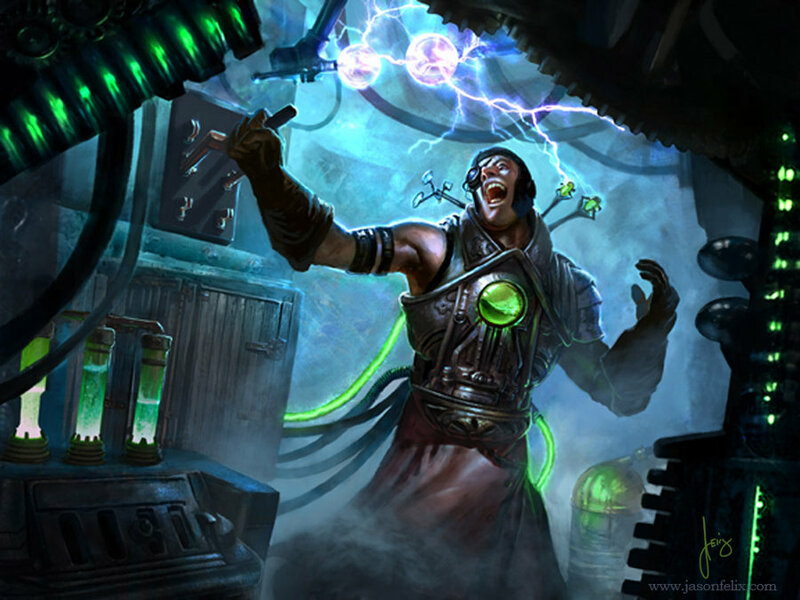 Innistrad's horror theme allows for some exploration of this tech - in the vein of 'mad science' - but not enough to carry a set, unfortunately. Vryn is a set that had only been hinted to, in the Planechase Trail of the Mage-Rings, but it seemed to have a pretty strong instants-and-sorceries theme, rather than an artifact theme. In Magic Origins we got to see more of the set, and while it can lean towards artifacts and colorless, as Mage-Ring Responder and Mage-Ring Network show, it still doesn't seem a perfect fit. The plane is primarily about a war over territory, not a classist conflict like steampunk usually has - and it features technology so alien that we can't really capture the 'gaslamp fantasy' aesthetic steampunk usually goes for. Vryn might have the mechanics, but it doesn't have the flavor. Alongside Vryn in Magic Origins, came a more promising plane: Kaladesh. As seen in Chandra's origin, Fire Logic, Kaladesh is a world that thrives on artifice, where naturally-born mages are so rare that they're practically unheard of. Instead of channeling magic themselves, the people of Kaladesh power their filigreed artifice with Æther canisters. Naturally-born mages - 'mancers' - are "something that's not been seen in many years", and are quickly crushed or recruited by the Kaladesh government, the 'consuls'. (It's implied that there exist 'dissidents' that the consuls take care of as well.) So, it's pretty clear that Kaladesh captures almost every idea that was pitched in the Set Design Contest, and is a strong example of the steampunk story. Furthermore, though Kaladesh is a plane inspired by India, it still includes many of the visual elements that distinguish it as steampunk and gaslamp-fantasy. This means Kaladesh can diverge from steampunk to make itself unique, yet is still identifiable as steampunk in order to draw interest. A perfect balance. From the very beginning, it's been assumed that Tesla would be a unique plane, one of our own design. This was not only because there didn't really exist a plane to capture our ideas, but for other, more important, reasons. Having Tesla as an Artisans-original plane gives us a lot more flexibility with our designs, as we don't have to capture any flavor or setting beyond what we decide exists. And it allows us to avoid stepping on Wizards' toes, and to diverge from the expectations they've built up for the plane. If we decide that Tesla is to remain an original plane, I think we can sum up the positives of this decision in one word: freedom. However, at the same time, having a solid Wizards-designed setting for Tesla gives us many positives as well. As Jay said last week, "Kaladesh gives us real parameters. Something we can make roots in and draw battle lines on, something substantive and resonant to judge our ideas against." Tesla is a very big and open-ended project, and while we have many devoted artisans, it has certainly been a daunting task designing a set from a blank page. As Chah noted, Tesla suffered a long time from this problem, from not having a clear goal. Tesla's goals have become better focused over time, as seen earlier, but we still have a very open question with not a lot of guidance. In pursuing Kaladesh as our plane, we give up a lot of freedom, but we gain a clear goal and guidelines to work from. I think we can sum up the positives of this decision in one word as well: direction. Should Tesla remain an original plane of our own design? Or should Tesla take place on Kaladesh? This is a big question with some huge ramifications for Tesla. This discussion might take more than a week, and if it does, that's fine. I think we should have a solid answer to this question before moving on with Tesla's exploratory design, so if we need to give this question more time than just a week, I think that's completely acceptable. Whichever answer we decide upon, it's going to have a big effect on the rest of Tesla's design, so we should figure this out as soon as possible. Although this is clearly a big decision, I'm not sure it's quite as big as you're describing. Remember how diverse the stories told on Dominaria we're. I think it would just about be possible to tell Tesla on Innistrad: we'd focus away from the angels and wolfir and focus on the mad scientists like Ludevic, and specifically imagine some kind of trend in their machine designs (perhaps prompted by a new discovery in the wake of the opening of the Helvault) that means a lot of the devices being built are X, where X is the kind of criterion we want for our set. We focus away from Thraben and Avacyn and focus perhaps on some areas of Stensia where the vampires are still oppressing the populace. Now, I'm not actually proposing this setting for Tesla: it's not a perfect fit, and I can't see any reason to do that rather than Kaladesh. (Personally I love Kaladesh and am not that keen on Innistrad.) But my point is it's possible. You don't have to include all aspects of a setting in a card set. So because we have a fair degree of flexibility in how we focus a set even after the plane is chosen, I think we don't need to actually decide what plane it's on just yet. We could try to establish some more specific plans for mechanics to use in the set, allowing the question of whether we're on Kaladesh or not to influence the mechanics discussion, but also allowing the results of the mechanics discussion to influence whether we want to be on Kaladesh or not. Some mechanics are more conducive to flavouring to fit that world than others. I *think* combining mecha could just about be made to fit Kaladesh, for example, but it's not as great a fit as some mechanics. Yeah, I might be overestimating this decision, sure. But I do think that deciding whether we're going with an original plane or Kaladesh is a big decision. The 'big effect' isn't that Kaladesh would be greatly restricting our mechanics or themes - it's that, depending on which option we go with, we greatly change how we approach the questions of setting, which is something I was already planning on discussing before we moved onto individual card design. Tesla is primarily a top-down 'steampunk' set, driven by its themes and its setting greatly. Because the setting is going to be felt in many areas of the set, deciding the setting is going to be a big effect - not 'big' as in a large impact all at once, but 'big' as in a ripple effect, something that affects lots of things over time. There are going to be many situations in the set where we're going to want to capture parts of our setting with cards, and deciding whether we're on Kaladesh or not determines what those 'parts of our setting' are. On the other hand, if we go with an original plane, we'll similarly have to spend time talking about setting, but in this case, we'll be making the setting ourselves. We'll have to define what our conflict is, what the magic on this plane looks like, what the artifice is driven by, etc. As I said before, this is definitely a question of 'guidelines' versus 'freedom'. I agree with you that the difference isn't too large, since Kaladesh is still so open-ended and we have the ability to focus the design as we wish. But I still think it's a significant difference. I also love Kaladesh, and I think it's a good fit for Tesla: it fits most of the ideas I liked most, and the other interesting things about it, I think would be good for Tesla: more ideas mean more creativity and maybe more unexpected ideas, more focus means clearer decisions and clearer goals. My worry would be, design can be really slow, so it's likely that there may be some future reason to rethink Tesla again, eg. if wizards release a block set on Kaladesh, or something. If we want to avoid that, there's a reason not to do it. But if we're happy to move forward and say "ok, if something like that happens we diverge at that point and make our Kaladesh even if it's different" then it would work ok. It is the freedom we've had that has caused the project to meander so long and morph so many times. If you want to accomplish something, you've got to have a target to aim for. If we want to practice the skills that R&D uses every day, we should adopt similar goals and processes: Build a steampunk set for Kaladesh; work with creative to make it resonant; do something fun and new within those constraints; and on a timeline. (In this case, our timeline being to finish before Wizards spoils an actual block staged on Kaladesh.) We still know very little about this plane compared with those we've actually visited, so we still have plenty of room to explore crazy ideas, but without a thematic anchor, we'll never make definitive progress on the Progress Set. That's definitely a big factor. Do you think this is not? I was kind of thinking that. It's also likely that a community set with a limited amount of time to invest is just naturally slow at jelling. But then, kickstarting the worldbuilding by taking an existing plane is probably a good thing. I'm sure the community COULD come up with a plane as interesting, but I think it would drag things out further, whereas adapting to an existing plane would both be an interesting challenge, and would help move ahead quickly. I also like that Kaladesh comes from a different cultural background and is in other ways unusual: it's too easy when coming up with ideas for everything to be vaguely-anglophone, and a community set is especially likely to end up in a middle-of-the-road idea even if people push for interesting ideas, because it's hard for a large group of people to pick something unusual and run with it. Agreed that Kaladesh's unusual nature may be helpful. It certainly is distinctive. I agree with Jay that too much freedom causes a lack of direction. That settling on setting would help define what's out of bounds for the project. I think of all the WotC planes that we've seen Kaladesh is the most appropriate. If we wanted to slot into a more established aesthetic that still has room to grow Kaladesh is the way to go. That isn't to say that Tesla couldn't be its own plane. Its completely possible for us to take the mechanical ideas that we have and spend the next few weeks hammering out an aesthetic that will give us a setting. Then fitting our mechanics within the box that we've defined. Going with Kaladesh feels like a bit of a cop out since we won't be creating everything from the ground up. Building on expectation is an important skill though, and one that is ripe for the picking after the Origins release. I can see arguments for both sides, but that being said I'm casting my vote for Kaladesh for one simple reason: We'ed be able to check our work. R+D likely knows a bit more about Kaladesh then we do, but it would be an opportunity to take something that we've been given an idea of an see how close our vision winds up to theirs. "Its completely possible for us to take the mechanical ideas that we have and spend the next few weeks hammering out an aesthetic that will give us a setting. Then fitting our mechanics within the box that we've defined. " This was actually very close to my planned trajectory for Tesla. My original plan - and the plan we'll probably go with if we decide on a new plane for Tesla - was to finish hashing out the basic categories of mechanics and getting some ideas for each, collect all the mechanic ideas in one post and offer a 'last call' / extra week of refinement, then start talking about Tesla's settings and the roles we want mechanics to perform. IE "we need a mechanic to represent the oppressive factories", "should we have a mechanic to represent rebels? ", etc. I like the argument of being able to check our own work. It's a compelling one and we've seen it before with the M13 project and we're seeing it now with the Zeffrikar project. I vote for a unique plane for two reasons. First, I'm interested in a more dirty, junkyard Dickensian setting. Second, if we build our world, we can choose the best art for our cards, not the cards that best fit the setting we're trying to match. While I think the first point has merit, the second is a non-sequitur. Regardless of whether we go with Kaladesh or build our own aesthetic the art is going to strive to match both the card and the setting. I've certainly been picturing an Industrial Revolution-era for the aesthetic, but we've seen little enough of Kaladesh that those two ideas are not mutually exclusive. What about a setting in the recent past of Kaladesh? I agree, I like the Dickensian junkyard aesthetic, and that may or may not fit Kaladesh but it might have been through that period in the past. The problem with Kaladesh is that what we have now isn't particularly emblematic of a progress theme. Ghirapur is already a fairly advanced civilization, and the ruling class is repressive and seems to discourage experimentation. If we set the block in the recent past of Kaladesh, we have a bit of groundwork laid, but I'm not convinced that it's substantially more than just building a new plane from scratch. This is slightly off. The ruling class discourages unsanctioned magic, a la Chandra's fire magic. They repress natural magic, but the widespread network of tinkerers certainly speak to experimentation and artifice being normal and commonplace. I also think that the rebellious nature of the group Chandra's parents lead could very easily capture the junkyard, scrap-masters that we're discussing. Yeah. And even in Dickensian-world, it was still technologically advanced. Just because a world is advanced doesn't mean it has room for further advancement, yes? Still, this is certainly a valid criticism. 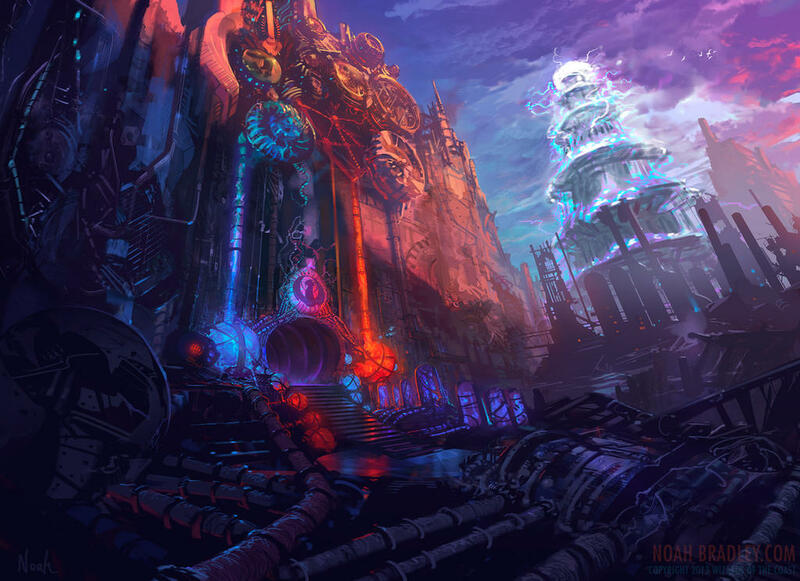 A world in the midst of industrial revolution is vastly different than a world which (judging by our glimpse of Kaladesh) has already gone through its industrial revolution, and has been technologically advanced for long enough that natural magic is gone. Being that we only saw the city of Chandra's birth, its entirely possible that natural magic still exists in the wilds. As a blue dominant society, it would make sense that Red and Green are the antagonists to the progressive nature of the plane. Also, the bit that we know about the AEther canisters sounds like a plausible way to introduce the Dickensian cost of progress motif. Progress itself can still be happening at a breakneck pace. In fact, if the modern world is any indication, the more technologically advance you are, the more likely it is that your pace of advancement will only increase. So, going back to Kaladesh. I guess my issue with it is that, despite the presence of inventors and machines, it feels like a very static, stable society -- akin to Fiora or original Ravnica where the plot events in the books hardly appeared on the cards. A world in "progress," to me, implies that there's a lofty end goal that the greater mind of the populace is turning toward. With Dickensian world it's competing resource grabs fueled by increasing mechanization, with the Izzet it's coming up with more and crazier experiments to catch Niv-Mizzet's eye, and for the Esper it's filigree-ifying the whole shard eventually. However, the rulers of Kaladesh seem much more invested in preserving the status quo, like the Azorius: they're blue/white, they have an extensive spy network, and they repress, rather than investigate, natural magic. There are also areas of the plane that they're content with remaining non-industrialized. There are artificers on Kaladesh, but all their inventing and tinkering (at least with Chandra's family) seems to be on a highly individual scale, without ramifications for the rest of the plane. The conflict of Kaladesh's story seems to me to be less a tale of progress and exploitation, and more a class conflict. The technology has already been invented, the peasants have already been exploited, and when the peasants revolt, they'll likely be using the same aether weapons as the upper classes. Agreed, though I have to add that Kaladesh isn't so well-defined that we can't spin it to be more dickensian. I've not seen anything that truly contradicts that. I've also got to add that the few-wizards/suppression-of-magic thing brings us back to the original idea of Ekkremes, where mana is a reduced resource. Oh, and no, we definitely don't need European culture for steampunk. I'm quite excited to explore Indian-inspired steampunk. As far as Kaladesh already being advanced and not in the throes of progress, that hearkens back to the world idea in which civilization rests on the laurels of its distant past: Where eons-old giant mecha preserve and sustain peace, but almost no one remembers how they work, and they're falling slowly into disrepair. I'm not suggesting these connections justify Kaladesh necessarily, and we certainly shouldn't seize all of them, but we could seize one of them if it still interested us. Jenesis, again, these are great points. There's actually not much said in the materials I saw about how the cities view the untamed wilds, or how technology is seen. What if there's some lofty goal, a dream of an invention, that hasn't been figured out yet? (For example, in the real world we're seeking the quantum computer, or the self-driving car... or jet-packs. :P) What if they really do want the cities to spread over the plane? What if the mechanical empire that Chandra grew up in is setting its sights outwards, hoping to expand in a colonialist manner? Likewise, the article states "artifice is an enormously important part of life on Kaladesh, particularly in the city of Ghirapur. The free spirits among the artificers, however, sometimes run afoul of the law." This doesn't imply that only the free spirits are making progress - just that they're pursuing a different form of progress, perhaps, or that they're making progress that isn't directly benefiting the law and the Consuls. Kaladesh in Origins was a personal story, so it focused on the things that Chandra experienced. But Magic's motto lately has been "visit a world then throw it into chaos." While currently Kaladesh is not experiencing the 'throes of progress', maybe our set would showcase a time when it is. Kaladesh has thrived on Aether canisters for centuries now, and artifice for nearly a millennium. Over the ages, artifice and the environment have found a delicate balance and live in harmony. But this hasn't been enough for the Consuls of Kaladesh. Ghirapur, the test-bed city of the empire, has found remarkable success in its thopter spy network, and their think-tanks have been producing incredible work. Free-spirited artificers and anomalous aethermancers are quickly found and recruited at best, or dealt with at worst. However, this isn't enough. 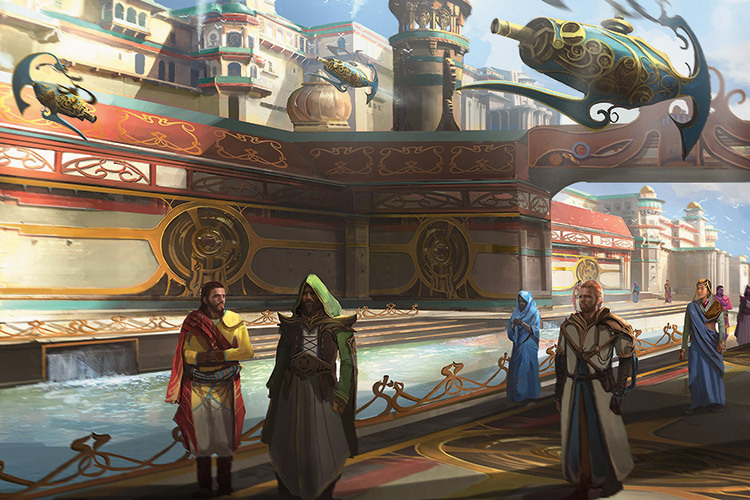 An ambitious Consul is determined to make Kaladesh a perfect empire, with no poverty, no crime, no insubordination, no rebellion. And though the spy networks have been helpful in finding dissidents and criminals, they haven't helped in preventing the treason or crimes that they were caught for. This Consul has seen the weakness and flaw of Kaladesh's machinery - it's only as good as man. Thopters can only report crimes; they can't prevent them before they begin. They have no ability to predict, to think. Even automatons, as lifelike as they seem, are simply regurgitating responses which were programmed into them. No, what Kaladesh needs is a machine that's more than a tool - a machine with a mind. 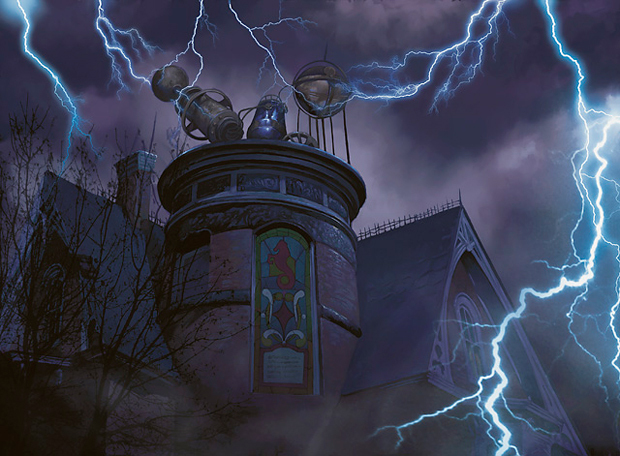 - Power sources are always in evolution, and perhaps the next big power source for Kaladesh may not prove to be as harmonious with nature as its current one. - The Consuls may seek stability, but perhaps as times change they need more drastic methods to ensure that stability. An empire can't rest on its laurels in hopes of maintaining peace, you know? FWIW, I'd play the hell out of the set with that story if you could somehow shoehorn mecha in there. Mecha are the war machines; Too grand for local enforcement. I agree that technological progress can be happening on Kaladesh. I don't know a lot of the lore of this world but it seems to me the Consul aren't that directly repressive; they just want to hold power by being the power providers. They would probably encourage further technological advances and inventions by the people as long as it makes people more reliant on this power, like Inanimate says. The aether canisters reminds me of Magitech in Final Fantasy 7. Maybe they are sucking dry the source of magic in the world in order to make this magic power source, which may be the reason why natural mages are so rare. If the canisters are sucking nature dry of magic so that natural mages aren't likely to be born, that would be a dark side of technology, rather than a purely positive form of progress. But I don't think it would detract from the theme of Progress. Maybe the problem hasn't caught up with the people of the world yet, and the focus in the first set could be more on the technological advances made through the use of the canisters. The second hypothetical set could show the problems erupting. I like the idea that the canisters are sucking nature dry of magic, resulting in less natural mages. That's a compelling theme. What happens when the populace discovers that, and some begin to yearn for power without artifice? Living under a government that openly employs omnipresent, magical, highly mobile spy cameras isn't oppressive? Maybe it's my 20th century USA-ian-ness talking, but I'd be pretty on edge if I were living there. FWIW, thopters are also frighteningly efficient compared to traditional security cameras, due largely to their mobility -- a network of stationary cameras can't be programmed to tail a suspect, call for backup if it experiences interference, or shut down surveillance in a designated area without leaving conspicuous gaps in footage. I can see why the average citizen of Kaladesh wouldn't regard it as a problem, however. For one, thopters are dang pretty. Enough so that people might genuinely enjoy hanging out in an area with a lot of them. Probably enough people get Consul-sponsored funding to create similar works of art that they can convince themselves that the only people being spied on are Those Other Bad People. 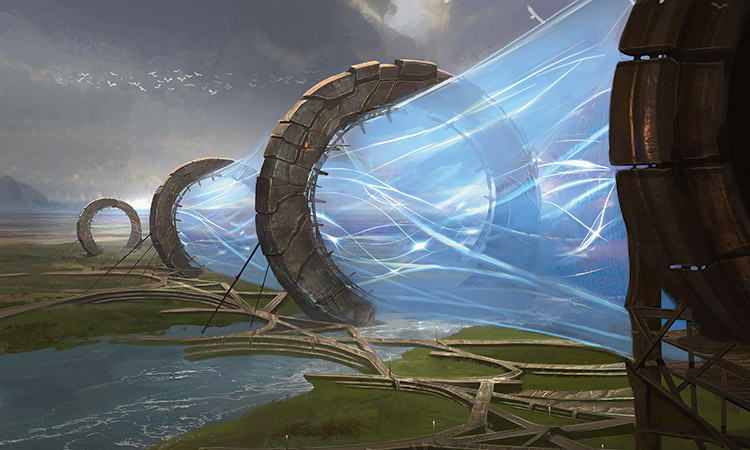 A land being sucked dry of natural magic would also be a great way to tie in planeswalker visitors, who would discover that their magic is unnaturally weak on this plane and then be key in the initial conflict between the consuls and the opponents of overreliance on aether. I think having the set be based on the plane of Kaladesh is the correct decision here. Most importantly this project needs direction and as we step out of exploratory design. Creating a completely new plane is yet another monumental task that in the end is going to create a similar end product to if we use Kaladesh. For those worried about it being too restrictive we have been only shown a tiny glimpse of the plane and so have plenty of space to create new districts and factions not originally mentioned while maintaining references to keep it cohesive. There are other reasons as well that Jay and Inanimate have mentioned already which I agree with as well. Indeed. I think Kaladesh could give us enough direction to be helpful, while not so much direction that it restrains us too much. It does limit our options in some ways - especially referencing typical steampunk tropes - but not all. FWIW, I'm fine with choosing not to set Tesla on Kaladesh, but we should establish strong and resonant details about the plane we're on. We need parameters! I move to have the setting be Lorwyn. Flamekin, Merrow, and Kithkin artificers are working to shut down/forestall the next Aurora, having begun to construct cities and settlements where tribes can intermingle. Elves represent an old order of natural rules and magic - resentment towards the new freedom and power of these lesser species working together, mixed with interest in the new beautiful constructs coming out of the tribepact. Fae and Giants both still feel the instictive call of the Aurora and the need to keep the plane's hourglass turning back and forth. Boggarts are... boggarts, in the slums or the swamps. Isn't the Aurora gone, as of Oona's death at the end of Eventide? I'm surprised Fiora, the Plane of focus in the Conspiracy set last year, hasn't been mentioned. It has an artifact theme, a theme of politics, class warfare, and open rebellion. It also has a major focus on aesthetic beauty, art, and italian culture. In fact, we would not be able to do a Dickensian vibe here, and need to shift to a Renaissance feel. But it is a very strong candidate, I think. I actually realized Fiora was a forgotten contender just yesterday. Definitely close in feel to a traditional steampunk plane. I think the main thing keeping me from liking it is that it has no sense of an industrial revolution. There's beautiful clockwork everywhere, but clockwork doesn't exploit a power source like steam or, in Kaladesh's case, aether. I do agree that its other themes are a solid fit though. Fiora has not really a Steampunk feel. It's is more based on Italian Renaissance. Its higher artifact as-fan in Cospiracy was dictated both by that flavor (Leonardo Da Vinci's contraptions et similia) and by the presence of the draft affecting artifact creatures, imho. P for Pizza has a compelling point. Clockwork doesn't have the same resource-driven system that Steampunk, or in Kaladesh's case Aetherpunk, do. I really like Fiora. It's easy to overlook just how deep a well the Venetian myth is, even before adding the italian renaissance as a whole. I think clockworkpunk is as easy as aetherpunk to bridge into steampunk, if we need to fit that idea, and I think the surrounding environments have a nice flavor to them. The sense of innovation on the inside of the city and exploration outside of the city is strong, and I think the power struggles combined with the atmosphere make for a lot of good opportunities in storytelling on individual cards - about as succinct as flash-fiction can be. I'm personally very driven by the opportunities Fiora provides, but they're probably not unique to Fiora, so I won't discount other planes as an alternative. Yeah, Fiora is definitely a contender... I don't think it has as compelling of conflicts or technology as Kaladesh, though, and again, I think a big reason is that clockwork fundamentally lacks the same resource-driven nature of Kaladesh's aether-technology. What if Kaladesh turns out to be the spring large set? Or next fall's? This seems like an undesirable collision to me. Maybe, although Wizards has had trouble securing trademarks for planes in the past when they go to use them as full sets. It'd be interesting if they've worked out that glitch. consider that it is highly likely that Lilianna plays a large part of the Spring set due to her being the only Origins planeswalker not involved with Zendikar. If that is the case I suspect a completely new plane as she searches for the remaining two demons. Even if we are visiting Kaladesh soon, it doesn't seem like a huge issue to me. As Lee Owens said earlier, we'd be able to check our work at the very least. I don't think Wizards doing a set and us doing a set naturally cancel each other out - sets like Zeffrikar and such seem to do fine, and serve as a good measure to WotC's choices. I believe Regatha was a known quantity as far back as The Purifying Fire, in which Chandra was living at a monastery there. If they didn't do Regatha (or Kephalai, I suppose) they'd have to come up with another plane which Chandra would have visited yet somehow wasn't involved in the storyline of, seeing as Zendikar was already taken. Vryn, on the other hand... I always thought was a cool plane since I first saw it on the Planechase card, and I'd very much like to see a block set there. Agreed, Jenesis. I've tinkered with Vryn myself, many a time. For Kaladesh, I think we really want to do something like what Innistrad succeeded at and what I think Zendikar tried to do, in some ways. One of the really best things that Innistrad did was develop each of the townships to a different conflict. Stensia and the nearby towns had vampires, Kessig had werewolves, Thraben had zombies, etc - there was a general fear of this horror creatures, you could be beset upon by anything anywhere, but there were particular struggles and environments shaped by those struggles and characters shaped by those environments. Part of the reason these all felt connected was genre, and part is because while humans played a different role in each setting, they were invariably the protagonists, or at least our "in" for the story. It makes sense to have Ghirapur be the city with a U/x and R/x conflict. One of the next steps in hammering out our vision for the plane is to identify which conflicts we might want to tell, which ways we can translate those conflicts to Magic, and how we can thread those conflicts together so they can feel "connected". AEther might be the overarching connector - in Ghirapur, R/x runners evade U/x Consuls, but in Karutha, G/x try to protect natural AEther springs from B/x pollution, in Rakesh, W/x mechanical automatons want citizenship and rights to their own AEther supply - but it doesn't have to be. Mecha, machine intelligence, luddism, and any of the other themes of progress we've worked on so far can be narrativized or integrated. (I'm a little late to this - obviously as shown in the posts above we've got a number of story seeds already.) I do believe having 3-6 highlightable conflicts within an integrated world results in a better set. Of course, we'll throw ideas into the mechanical ringer for a long time and fine-tune/redraw the Creative as needed, but I think breaking the setting into a few stories should be the next step. These are excellent ideas, and this is a wonderful insight, Pasteur! This is some seriously impressive analysis. I just wanted to mention something about this set's original pitch suffering from the problem of being "like Mirrodin, but not Mirrodin." When we had people submit pitches, the purpose wasn't to have a contest, it was more like scouting out what design challenges each world idea holds. To me, the GDS2 seemed to show some worlds have the type of problems where if you don't solve it, you just get a worse execution of the world but at least you can still make a set, while other worlds have problems of the type where if you don't solve it, you are stuck with no way to go forwards and you don't know if you are going to stumble onto a solution in a week a few months, a year, etc. 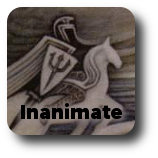 An example is Ocean World's problem of "How do you represent the feel of naval combat?" and "How do you handle colors other than Blue?" In the GDS2, the question of "How do you represent Light & Dark in a Light vs Dark world?" seemed like a really tough problem that needed to be solved before anything can be done. One of the questions for Ekkremis that wasn't completely solved was "If this set has a lot of artifacts representing technology, how is it different from Mirrodin?" In terms of the play, will it have the same kind of artifact matters mechanics, a set composition with a high number of artifacts, just with different names and flavors? Looking at the Kaladesh cards in Magic Origins, I think Wizards did an amazing job with the Thopter-making cards. (Although I don't know if it's a taste of what's to come in Kaladesh, or just something they chose because it's something they can do withing the constraints of a wide-themed set like Magic Origins). Having creatures accompanied by artifact tokens is a great, simple way to show a plane where the denizens are making artifacts, rather than a plane where the denizens are artifacts. The way the tokens have flying makes them feel like they're devices with some kind of mechanical functioning, in the simplest way possible. "Having creatures accompanied by artifact tokens is a great, simple way to show a plane where the denizens are making artifacts, rather than a plane where the denizens are artifacts"
This is very important, and something I was going to discuss as we moved forward with design and begun talking about our 'artifact mechanics' and the ways in which we use artifacts in the set. I think it's important to make Kaladesh a plane where artifacts are clearly tools and devices, which would greatly differentiate it. Origins did well by having tokens that follow artificers, and by clearly flavoring all of its Kaladesh artifact creatures as unthinking machines - but I think another unused vein could be a higher emphasis on Equipment and noncreature artifacts as well. But yeah, these are great points you bring up. Luckily, with Mirrodin now New Phyrexia, we have a little more wiggle room for an artifact set. I think Kaladesh provides a lot of specifics and these specifics lead to inspiration. It seems to be sparking off imagination already. When we take these aspects of Kaladesh and think, "How does this world detail apply to the set we've been thinking of?" it leads to conclusions we wouldn't have thought of otherwise. I think this is similar to what happens when you design cards. If someone is told to design 100 common cards, that person might be at a loss. But as many of us have experienced, if you map out a list of standard effects that you know you want in the set (a pump effect, a kill effect, a card draw effect, etc.) and make a chart, then think, "what does a Common draw effect with set mechanic A look like?" "What does a Pump effect with set mechanic B look like?" then it is surprisingly easy to fill out a set of Commons. Great points here. I agree that Kaladesh serving as a starting point is one of its big boons.